This section was prepared by alumni interviewers from the Harvard Club of Hong Kong for potential applicants to Harvard College. If you've done a little research on American universities, you've probably read that Harvard is the oldest university in the U.S. or that President Obama (or some other famous figures) went to Harvard. But what is Harvard like as a place to go to school? Is it suitable for you? And how do you get in? First some basics. Harvard College is the undergraduate division of Harvard University, which also includes several graduate schools. Unlike in Hong Kong, where a high school student applies to a specific faculty -- the medical faculty, for example -- and comes out six years later as a medical doctor, at Harvard and most other American universities, the undergraduate college is separate from the graduate schools and has a separate admissions process. This website is about Harvard College. Harvard is in Cambridge, Massachusetts, a town that neighbors Boston, on the northeast coast of the U.S. The Boston area has many other colleges: MIT, Boston University, Boston College, Tufts are all close by; Wellesley, Smith, and others are a bit farther away. Boston gets cold in the winters! A lot of people like the four distinct seasons of the New Engand area. To many Hong Kong locals who went to Harvard, some of their deepest memories of Boston are the beautiful winter nights when a thick snowfall muffles all sounds and brings an otherworldly peacefulness to the campus. What are the students at Harvard like? Harvard College has an extremely diverse student body, not only in terms of race or religion or nationality, but also in terms of the students' interests and strengths. There are students who are academically world-class -- students who are ranked internationally in math or Intel Talent Search winners -- but there are also accomplished musicians, athletes, actors, and artists too. 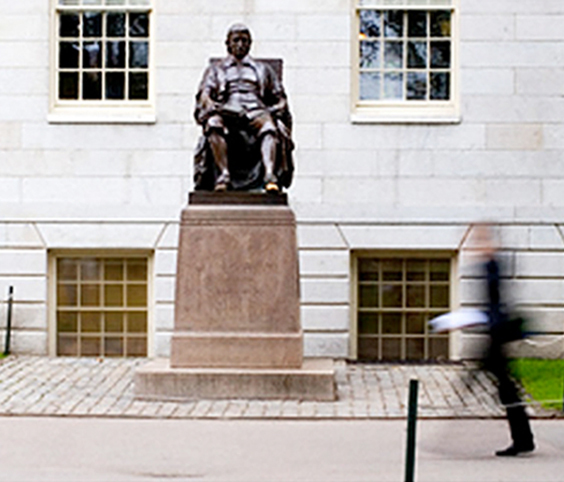 Unlike in Hong Kong, where university admissions is primarily based on academics, at Harvard (and most U.S. universities) the criteria for admissions are broader. For example, some students at Harvard end up focusing more on the student newspaper or their music than they do on their academics. And almost all students get involved with a club or a sport during their time at Harvard. For Hong Kong students, going to the U.S. for university can be a real culture shock. Reading about some of the differences in attitudes towards tertiary education can help you prepare. At the risk of over-generalizing, our experience is that there are several differences between the Hong Kong university experience and the American one. The first big difference is that there is a lot more diversity in U.S. schools. Compared to universities in Hong Kong, a typical top-tier American university has more ethnic, geographic, and religious diversity, and this may take some getting used to. Unlike in Hong Kong, where you tend to socialize mainly with your classmates in your department, in American schools, socialization cuts more frequently across different groups (academic, ethnic, religious, etc) because you live and participate in sports or clubs with people from various backgrounds. Another big difference is that students are generally expected to be a lot more independent in American universities. The university experience in Hong Kong is perhaps more structured than it is in the U.S.Students in the US have more choice in courses and activities, and more flexibility in putting together their schedules. Many of the top U.S. schools have an amazing amount of resources available to students, but again, you need to be independent and self-driven in order to really get the most out of your time at school. Yet another difference between going to university in America versus Hong Kong is that in the U.S., there is perhaps more emphasis on extra-curriculars and out-of-class learning. Part of the reason that admissions offices emphasize diversity so much is that students can learn a lot from the backgrounds of their peers. In fact, almost all students participate in sports or student clubs; it is quite expected that everyone tries to have a rich extra-curricular life, because of the philosophy that a huge amount of the learning you can do during your university years will come not from the classroom, but from interacting with your peers. The last big difference between the American and Hong Kong university experience is the philosophy of the liberal arts education. In many parts of the world, including Hong Kong, tertiary education is specialized, pre-professional, and technical. Students have to decide during their high school years what they want to do for - when they get out of school, and they spend their university years preparing for this profession, whether it be law, accounting, or engineering. In contrast, a liberal arts education is a general one. (The term "liberal" in liberal arts refers to the Latin word for freedom: these were the subjects that a free person (ie, a non-slave or a citizen) was expected to know.) At Harvard, for example, all students are expected to have a well-rounded education that encompasses a variety of disciplines including literature, history, science, maths, and writing. Practically speaking, America's university system has two main differences with Hong Kong's. First of all, your major may be totally unrelated to your future career path. For example, many students concentrate in History or Social Studies at Harvard College and go on to medical school; conversely, many students concentrate in biology and go on to law school. Secondly, in the American system, you do not apply for admissions to a particular department. Instead, at most American liberal arts colleges, you apply to the college and then decide what you want to major in only after you enroll. A liberal arts education gives you more time to understand yourself and explore different areas of interest before you decide what you want to specialize in. Ideally, a liberal arts education teaches you to learn, rather than just teaching knowledge. In an age when information is proliferating at an ever-increasing speed and when it's impossible to master all the knowledge in any field, it becomes more critical to learn how to learn, rather than to just memorize knowledge. A liberal arts education is cross-disciplinary and therefore exposes you to areas of learning that may come in useful later. If you aspire to be a future leader, you'll need to rise above your specific areas of expertise and work with others who have different ways of thinking. Finally, a liberal arts education helps you appreciate knowledge for the sake of knowledge, and in that way, helps you to become a more complete person. As you can see, there are many fundamental differences between going to university in the U.S. and in Hong Kong. Taking the time to think about these differences and to weigh their importance to you will make your college application journey a much more directed one. Harvard is looking for talented, accomplished, mature students who have the personality and drive to make the most out of their time at Harvard and who will contribute to society in the future. How can the Admissions Office possibly tell all this from your application? When you apply to Harvard, the main areas that the Admissions Office will look at include your academic record, standardized test scores, extracurricular activities, school and teacher recommendations, and application essays. In some cases, the Admissions Office will also consider your interview. Among the areas listed above, your academics are probably weighed most heavily, but even the strongest grades are not enough to guarantee you admissions. Harvard is looking for very strong students who exhibit creativity and intellectualism, not necessarily students who have the highest grades or scores in their school. Our advice here is to take the most challenging curriculum you can and excel in it. If you have electives, take subjects that you love, because your passion and your interest will show through in your application. Harvard requires the SAT I test and three SAT II tests. While Harvard has no minimum requirement for SAT scores, you should try to do as well as you can. However, you should also keep in mind that SAT scores are not everything. Standardized tests are only one factor among many in the whole admissions process. You should prepare yourself by familiarizing yourself with the format of the tests and by taking mock exams that are available from the College Board, the organization that produces these exams. Most successful applicants to Harvard have scores in the 700's on each of the SAT sections (Critical Reading, Math, and Writing). Harvard supports the Score Choice option, which allows students to submit only their highest scores as opposed to all the scores. The U.S. college admissions system probably weighs extracurricular involvement and achievement more heavily than the Hong Kong university admissions system. The most common extracurricular activities include athletics, student government, public service, music, and arts, but they can also include work and projects that you initiate yourself. Depth is more valued than breadth: in other words, showing dedication and passion in a few activities is more impressive than just being a member of many clubs. Demonstrating leadership and initiative can be a plus as well. When it comes to recommendations, you should get teachers who know you well to write these letters rather than famous people. The purpose of the recommendation is not to have a local luminary list out your achievements and then declare, based on his personal authority, that he recommends you. Instead, it is to personalize you and to make you come alive to the person reading your application. Someone who knows you well, a teacher who you're particularly close to, or a coach who has watched you develop over the years can do a much better job at this. The application essay is your chance to communicate directly with the admissions officer reviewing your application. You want to let them know your strengths and uniqueness... but you want to do it without coming across too boastful. It's a tricky balance. Write about something very meaningful to you, yet also interesting, something that will reveal the type of person you are and make you stand out from the crowd. And if you're stuck on ideas, sometimes it helps to read what other students have done -- there are several books of successful application essays that you could get at a library. In addition to the essay, transcript, etc., students are also free to submit CDs, DVDs, academic or creative projects or anything else that best represents academic, extracurricular, and personal accomplishments as a part of their application. Harvard does not require an interview for international applicants and not having an interview will not adversely affect your application. If you are required to interview, however, you can prepare by thinking about questions you'll likely be asked, such as what classes you most enjoyed or which extracurricular activities you spent the most time on. Be relaxed: Harvard's interviews are definitely not high-pressure interviews. The interviewer wants the atmosphere to be relaxed because he/she knows that your real personality will show through only if you're comfortable and just being yourself. The best interviews lose the dynamic of the student answering questions and become just a conversation between two people. You can also apply online using the Common Application. A: There are no quotas for admits from Hong Kong (or for that matter, for any regions or schools, or other groups). Over the past ten years, we've usually seen about 2-7 students get in from Hong Kong high schools each year. Most years, the figure is 3-5 students. However, this figure does not include the significant number of Hong Kong nationals who go abroad for high school and do not apply from Hong Kong. The Hong Kong Harvard Club does not know how many students apply each year, as we only see requests for interviews from the admissions office. A: Admissions is possible from ANY school, since Harvard looks at the student and not the high school. The admissions office truly does look carefully at each application it receives and does not limit admissions to any group of high schools. In the past ten years, Harvard has accepted applicants from the following schools: Canadian International School, Chinese International School, Diocesan Boys' School, Diocesan Girls' School, French International School, German Swiss International School, Hong Kong International School, International Christian School, Island School, King George V, Li Po Chun United World College, Shatin College, and South Island School. A: Harvard's policy for conducting alumni interviews varies from country to country. In Hong Kong, applicants will be contacted by a local alum if the admissions office requests an interview for you. Not getting an interview will not adversely affect your application. A: You don't need to prepare. Even though you might be nervous, be yourself and try to view the interview as a conversation and not an interrogation. You'll probably be asked about both your academic and non-academic activities. It might be helpful to have a printed out list of your activities and test scores as well as a copy of your transcript and to save your interviewer from having to take notes. A: Yes, definitely. The admissions officers who review Hong Kong applicants are familiar with the local school system. A: Many international schools in Hong Kong follow the GCSE or IB curriculum which are 13 years long. Also, local schools also have a 13 year program, at least until 2012. Harvard's admissions office encourages students to complete the program they're in because they think that students will be more mature and have stronger applications with that extra year. And indeed, almost all students who apply from Hong Kong, especially from GCSE or IB schools, are in grade 13. However, there have been a small number of students who successfully applied from a local school in grade 12 (i.e., Form 6). A: Yes, the Admissions Office considers your background when interpreting your scores and grades. However, the reality is that strong English skills are essential to be successful at Harvard and other top US colleges. Low verbal scores can indicate less strong English skills, so the Admissions Office will look carefully at your written English in the essays and on the essay portion of the SAT, plus comments from your teachers and your interviewer with regard to your English abilities. If English is not your native language, you might want to take the TOEFL.